SKU: PKC04. Categories: Party & Event, Tables, Chairs, & Tents, Tents/Canopys. Tags: canopy, center pole, picnic, tent. This pop up canopy is a light-weight canopy good for sheltering small set-ups such as food tables or art displays. They set up and tear down very easily and quickly. They can be set-up by two people in less than 2 minutes. 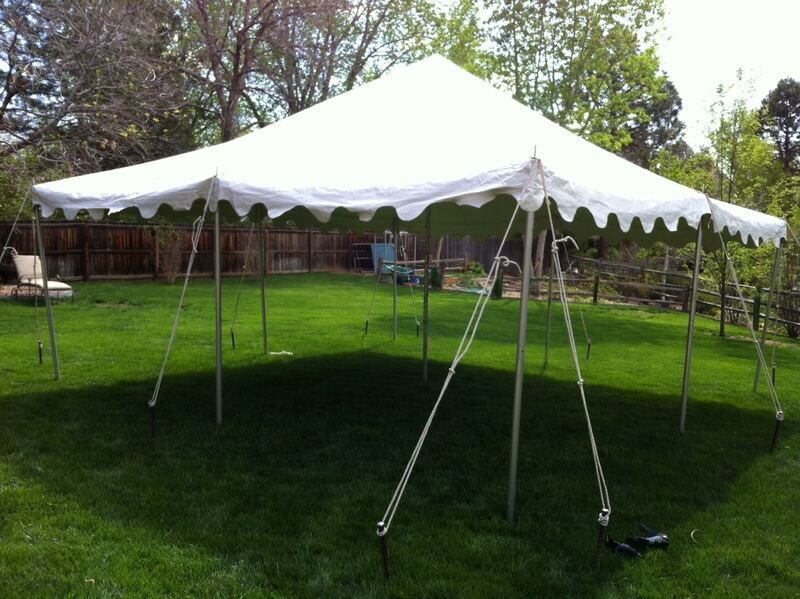 This canopy requires an open area of at least 11′ x 16′ to be set up in. Sidewalls, lights, and tent heaters are also available for this canopy! They include 4 water weights with straps to help weight the canopy down (you will need a water source to fill the weights). With the weights filled and attached, the canopy is safe is winds up to 20 mph. If winds exceed 20 mph, the tent MUST be torn down. No cooking or grilling can be done under this or any canopy. All Seasons Rent All does not offer set up or tear down of this type of canopy.